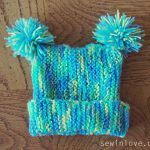 This baby bonnet/hat is fantastic knitting for beginners. You’ll get lots of practice of basic knitting stitches, like rib stitch and decreasing stitches. 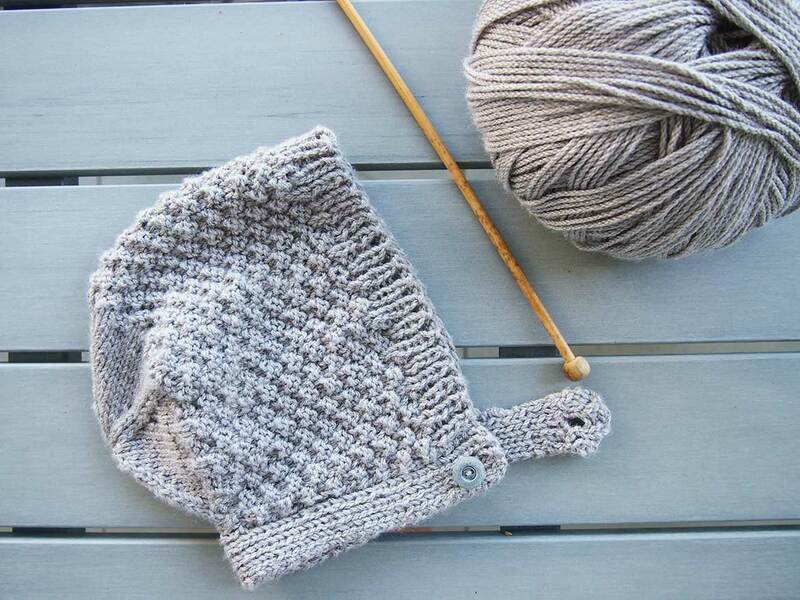 The beautiful bumpy pattern of the bonnet is created with simple knit and purl stitches . It’s still summer in Australia, so I was probably the only crazy person knitting a wool hat for my baby in the heat of summer. We are, however, in Japan on vacation at the moment. Up here in the northern hemisphere it’s the middle of winter. We’ll be visiting my Obaachan (grandmother), who lives in far north Japan, where it’s extra snowy and extra freezing. Hence the need for a warm hat for Umi with straps to make it stay on her head – yay to bonnets! 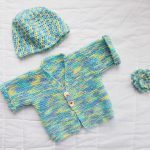 This knitting pattern is from the gorgeous book, Vintage Knits for Modern Babies by Hadley Fierlinger. 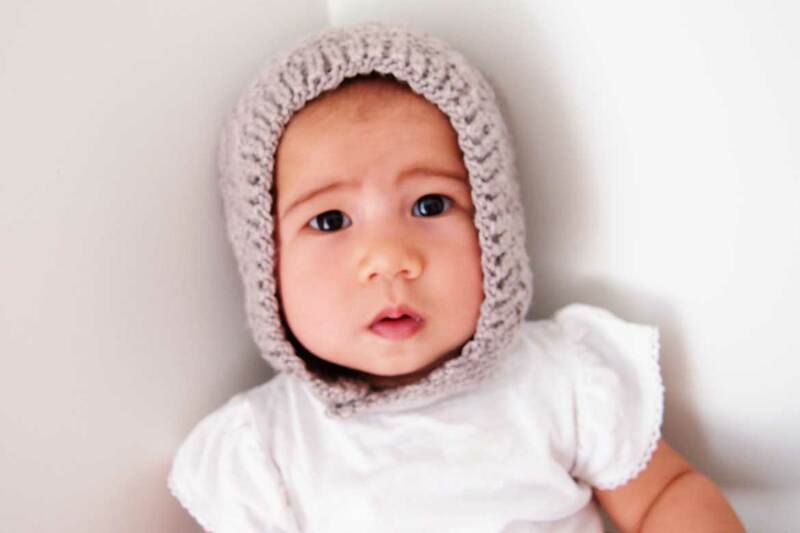 You can get the Modern Baby Bonnet knitting pattern for free via Craft Foxes. The bonnet looks way more complicated than it actually is to knit. The “bumpy” pattern on the bonnet is made with simple knit and purl stitches, and knits up very quickly. I think the only tricky part was shaping the back of the bonnet, but if you scroll down to the comments on the pattern website, someone has kindly explained in detail how to do the stitches required. I think this pattern makes perfect knitting for beginners! If you go to Ravelry’s page for Vintage Knits for Modern Babies, you’ll see all the beautiful knitting patterns included in the book. I think I need to knit one of those Ballet Blossom cardigans for Umi! You can purchase Vintage Knits for Modern Babies from Amazon. I used Bendigo Woollen Mills Stellar in the colour “Shell” to make Umi’s bonnet. Being 50% wool / 50% bamboo, it’s nice and warm without being too heavy. Bamboo seems to adds nice silky touch to the yarn as well. Bendigo Woollen Mills makes beautiful Australian yarn and I love that they sell BIG balls of yarn. One of the highlights of being back in Australia is that I can order yarn economically from these guys! Our Japan trip included the stopover in Guam to attend my childhood friend’s wedding. I was very excited to wear my front zipper Burda patterns dress to the wedding! In Japan, Umi met her great-grandmother for the first time. My parents are with us on the trip too, so it was wonderful to have four generations of our Japanese side of the family in one place. 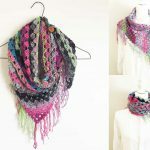 For more knitting for beginners, check out my Knitting Pinterest board! That’s so cute! 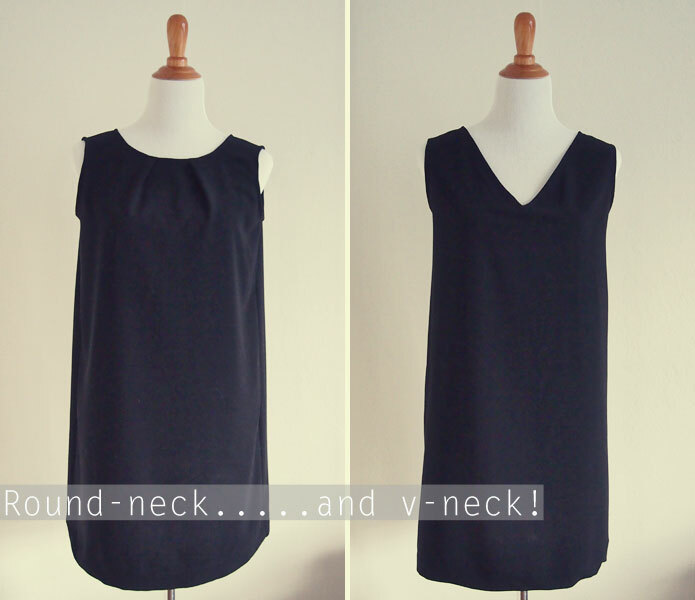 I’m always on the look out for pretty beginner projects. Off to check out your pinterest board now! haha no it doesn’t and I know exactly what you mean! 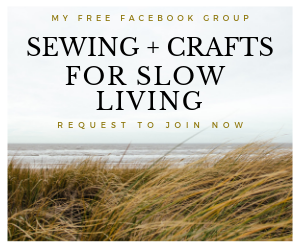 Hi Linda – you just need to click on the link in the blog post and it’s there. Hi, Rin! 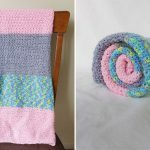 Have you found that this project uses the full 50 g skein? Is it possible that you could make two bonnets out of one skein? 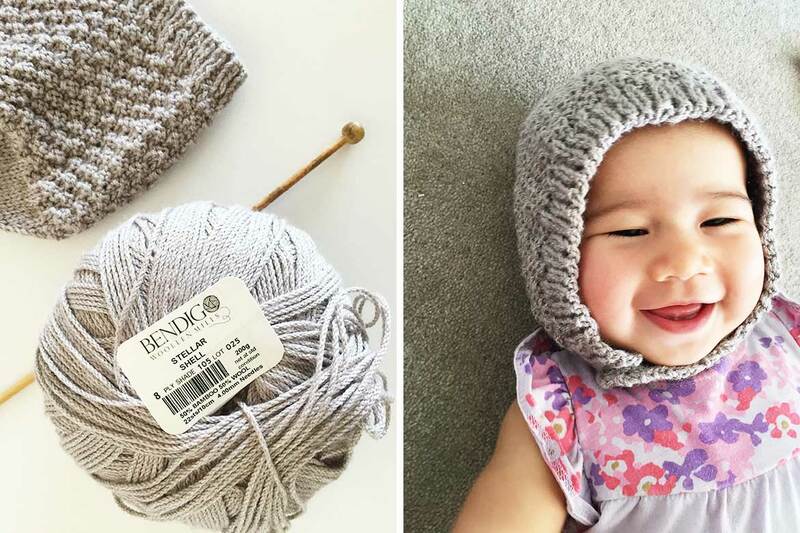 My sister-in-law and my friend both have babies in the 6-12 month age range and I want to try making bonnets for both of them and am curious if I can do it with just one skein. Thanks! I think it does need more than half the skein. Better to have extra just in case. Did you have any difficulty attaching the band to the more curved shape of the baby hat? 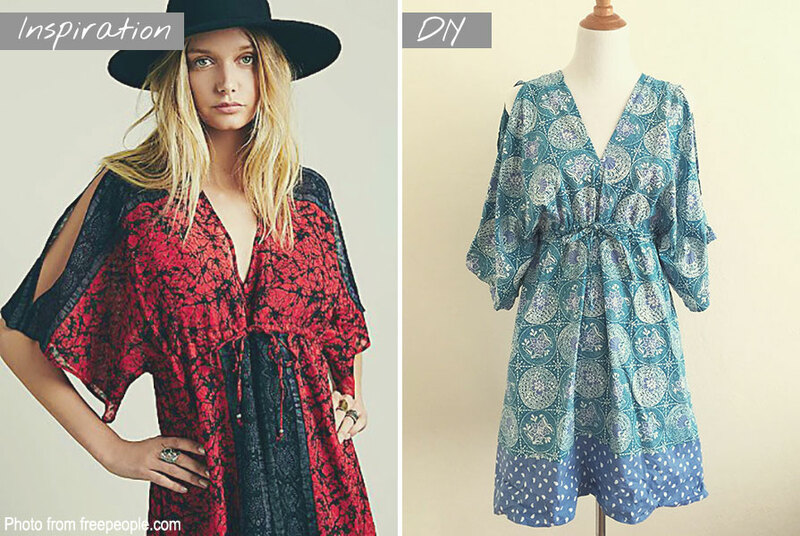 Not really – it’s like attaching any band to a hat, sweater, cardigan etc. I used safety pins to evenly distribute the band to make sure it attached to the hat evenly. I made this bonnet for my one-year-old and I love it! But I want to make her a new one for next year when she’ll be 24 months… Any ideas how I can enlarge the pattern? Love this bonnet BUT having problems — I’ve got in a muddle with the cap and decreasing. When I did the 1st row and it said decrease 3 times, there were lots of stitches left, so I decreased again. I obviously am doing it wrong because after doing 15 rows, I had 29 (I think) over but should have had just 9. I thought I had got the pattern right but don’t know what to do now. Can you explain the decreasing to me please – even though it reads simple enough . I made this bonnet and liked it very much. Very easy to make yet looks impressive. Thanks for the pattern.